One of the first things I do when I get back from holiday, after I've wandered through every room of the house is to check to see what's been going on in the garden. I like to see what's flowering, what's finished and to check on my veg to see if they've survived. This year was no different and before the kettle went on for that oh so important first cup of tea I was out in the garden armed with my iPhone to find out how the garden had coped without me. The sweet peas had doubled their height, which is what I expected them to do - and it was good to see the flowers are starting to form. Then I spotted something exciting - the agapanthus has a flower too, it's not out yet but it's the closest we've got to a flower from these year-old plants. So it's very exciting, in a plant kind of way. The new clematis I bought earlier in the year has also started to flower, and it does have rather shy deep purple flowers. The alliums that flowered the day I went to Bristol have now finished, but are still looking elegant and add some height to the small bed that runs alongside the patio. The schizanthus from Annie's seed swap were flowering - aren't they pretty? And you can see why they're often known as angel's wings or butterfly plants - they're on the shadier side of the garden, but that makes them look even more dramatic. And then even more excitement. My long wait for a red hot poker could be almost over, and it's been a long time coming! This plant is a couple of years old now and last year it was disappointing, I think the snails and slugs got to the flowers before I even spotted them. But this one looks strong and it may just make it. I'm putting that down to the mulch I gave it earlier this year after I saw the series on South African plants on Gardeners World. Further up the garden there was a blast of blue - and a rather unkempt one at that. I'd clearly not tied these Canterbury Bells tightly enough. They're back under control now though. Another first. The peony was flowering - it was flopping too, not surprisingly as it is a bit of a whopper. 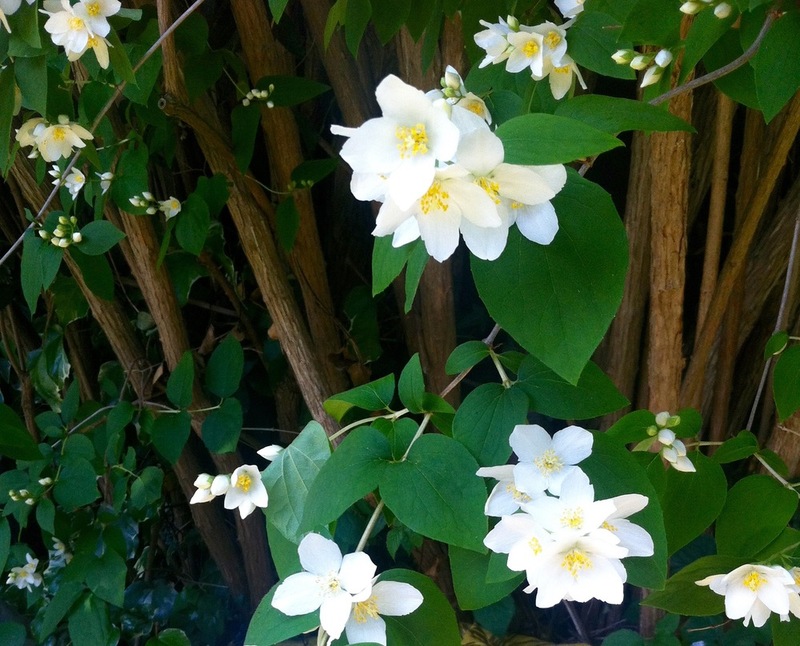 And the mock orange is out too, we'd seen - and smelt - some in Munich's green spaces and wondered if ours was out. It is and it definitely fills the end of the garden with scent. The black elder is also flowering, the more usual one is as well but that's taller than the fence and rather unsportingly the flowers all face away from our garden! In the greenhouse the relative of the ginormous Norfolk geranium was doing its best to rival its predecessor, but it was outdone by the amaryllis which shares the same pot. Why have all these plants decided to flower while I've been away? My tomato farm - that's my pet name for my many tomato plants - had also done well. As they were still quite small I'd dug the pots into the raised beds under the cherry tree and hoped they'd be ok. They were looking a little thirsty, but nothing a good soaking wouldn't fix. It's really not on for the weather to be good when I'm away! As well as checking out the garden, this year I also wanted to pop over to the allotment to see how the plants there had coped. We'd spent a day there digging just before we went away and I'd planted tomatoes, dill, sweet peas, lavender cuttings, a pumpkin, some more schizanthus and sown some runner and broad beans. So I wasn't quite expecting to discover an artichoke, but it seems I've inherited one amongst the grass. As I was checking the plants, which were fine - MOH called over and asked where our hose was. And he was right it wasn't there, I'm hopeful it'll turn up but I expect it may not and I'll be sourcing another one before too long. That's increased my resolve to get some lockable storage on the plot sooner rather than later as it's not much fun carrying everything we need each time we visit. So with everything in the garden and on the allotment watered and recovering and I like to think pleased we were back, it was time to get some more of the allotment cleared and ready for the brassicas I'd ordered. It's completely normal to order plants while you're away isn't it? We cleared a section approximately 10ft x 5ft - measured by me laying down (seriously), forked in some compost and set about planting the five cabbages and five purple sprouting broccoli plants that arrived in the post the day we arrived home. That's planning hey!? I already had a couple of lengths of white tubing and an old hula hoop was cut in half and put to good use alongside these to give my tunnel more support. Then with some new netting thrown over the top my brassicas were ready to do their thing... I was quite pleased with my engineering prowess, let's hope the foxes aren't too intrigued by it. So everything in the garden - and the allotment - coped perfectly well without us which is great, but it did mean that the next job on my list was to tackle the holiday washing. And that's never so great, is it?